Covercraft has been named the Official Car Cover of the Indianapolis Motor Speedway Museum in a partnership that includes premium car care products company SONAX USA. The IMS Museum has approximately 350 vehicles in its collection, including some of the most significant and rare race cars and passenger cars in existence, and protecting the vehicles, whether on display, in transit or storage is the highest priority. “The relationship with the Indianapolis Motor Speedway Museum reflects Covercraft’s commitment to the preservation and protection of vehicles of all kinds,” said Mark Korros, president and CEO of Covercraft Industries. 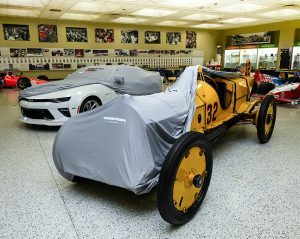 Covercraft covers protect the Marmon “Wasp” and 100th Indy 500 Camaro Pace Car. Pauls Valley, Okla.-based Covercraft has a library of more than 85,000 distinct car cover patterns, making it possible for Covercraft to create custom car covers of virtually any size and design for its customers. The IMS Museum-Covercraft-SONAX USA partnership started in earnest in late February, when nine leading custom auto detailers from around the United States converged on the IMS Museum, and spent three days detailing 10 cars in the collection. The detailers worked in the Museum’s basement on cars chosen specifically for their historical value, and each car was placed under a custom Covercraft cover when finished. For information on Covercraft products, please visit: www.covercraft.com . A full listing of SONAX USA products is also online, at: www.sonaxusa.com . About Covercraft: Covercraft Industries, LLC is the leading branded manufacturer of automotive, marine and recreational vehicle protection products, as well as a market leader in outdoor home and garden protection products. Covercraft’s product offerings include full vehicle covers, seat covers, front end masks, dashboard covers, window sunscreens, patio furniture and outdoor kitchen covers, and other products that preserve and protect. The company focuses on custom fitment with a library that includes more than 450,000 patterns for distinct automotive and outdoor protection products. Covercraft is certified to both ISO/TS16949:2009 and ISO 14001 standards. Covercraft owns additional market-leading brands including ADCO, Carver, Colgan, DashMat, GT Covers, Marathon Seat Covers, Precision Fit, PCI and Wolf. Licensed partnerships include Barrett-Jackson, Carhartt, Ford, Tommy Bahama and Winnebago.